NOTD Featuring ILNP Bermuda Breeze! Hi everyone! I’m back! Yesterday I changed out my mani that I had had on for almost a week… Once the staining is gone on my nails I’ll start posting more often. I bought about 5 of ILNP’s colors from their spring collection about 2 months ago and I am in love with them all! The one I’m wearing has to be my favorite though. 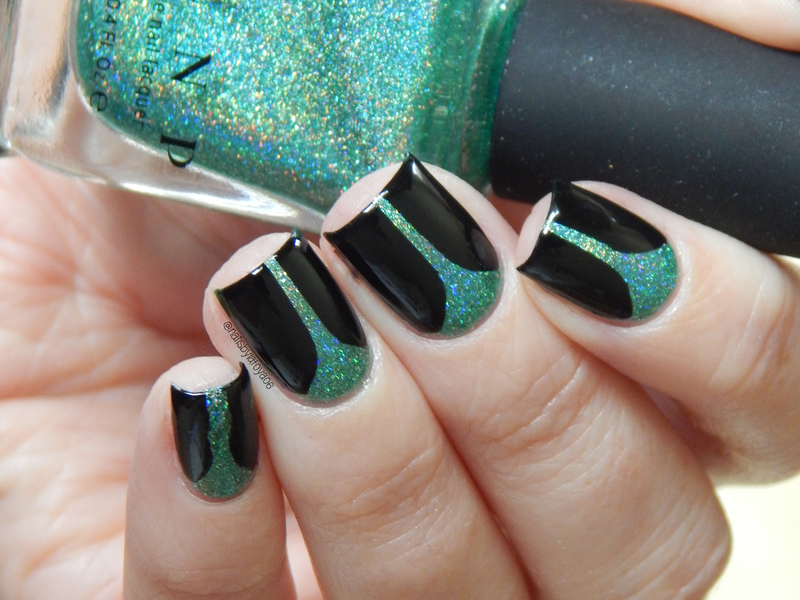 Bermuda Breeze is a gorgeous teal/green holographic polish that glows in almost every light. I also used What’s Up Nails Stiletto Vinyls for the nail art and Wet n Wild black cream for the black polish. The WNW is only .99 per bottle which is such a steal! Like I said, this polish glows in any light just about! I can’t wait to try out the rest of the colors I bought and share them with you all. Thanks for reading today and I’ll talk to you all soon! This entry was posted in Beauty, Nail Art and tagged beauty, makeup, Manicure, Nail art, nails. Bookmark the permalink. ← Marble Nailart and Introduction to my Youtube channel! I need that polish lol! !